Fennel, otherwise known as Foeniculum vulgare, is a plant belonging to the genus Foeniculum. The fennel plant is native to the Mediterranean region, and the plant produces yellow flowers. Fennel is also an edible plant considered both aromatic and flavorful. In addition to culinary uses, fennel has several purported medicinal uses. Fennel powder is the powdered form made by grinding the seeds from the plant. Health supplement manufacturers use the fennel powder to produce fennel health supplements. You should, however, speak with your doctor prior to using fennel as a health supplement. Ancient Greeks and Indian cultures used fennel for cooking and as part of traditional herbal medicine. The Greeks and Indians traditionally combined fennel with other herbs to make home remedies for the relief of gastrointestinal problems such as acidity and indigestion. The essential oil of fennel contains approximately 5 percent limonene, 50 to 80 percent anethole and 5 percent fenchone. Additionally, the oil contains trace amounts of a-pinene, estragole, b-pinene, safrole, b-myrcene, camphene and p-cymene. 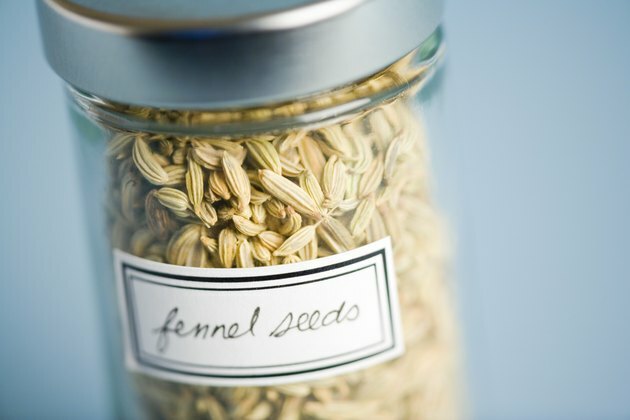 The seeds from the fennel plant also contain fiber and complex carbohydrates. Fennel contains nutrients including vitamin B-3, magnesium, molybdenum, copper, phosphorus, iron, calcium, manganese, vitamin C, folate and potassium. As a health supplement, fennel can help to prevent gas, support digestion and function as an expectorant that can help to relieve minor respiratory problems such as mucus. Fennel also contains anti-inflammatory properties when used externally. The leaves from the fennel plant can facilitate the healing of wounds and burns. The root of the fennel plant is diuretic and can help treat urine infections. Fennel also contains a combination of phytonutrients including the flavonoids rutin, quercitin and kaempferol. Fennel also has antioxidant properties and as a dietary fiber, it can help lower your cholesterol levels. Health supplement manufacturers offer fennel supplements in powdered form. As a supplement, manufacturers recommend taking 1 to 4 g per day of the powdered fennel supplement. The Food and Drug Administration, however, has not established a recommended dose for fennel powder. There are no known side effects of consuming fennel powder supplements, although you should speak with your doctor prior to using fennel powder if you are attempting to treat a specific medical condition.